Neonatology is a specialty within pediatric medicine that provides care for sick and/or premature infants. It is an area of medicine that is very young in comparison to other areas of medicine. This is also true for the newborn babies that begin their lives in the neonatal intensive care unit (NICU). Infants less than one month old are often referred to as "neonates." These neonates can be born as early as twenty-four weeks gestation (five months of pregnancy) and spend several months in the NICU. The NICU is a highly technical specialized unit in a hospital that provides medical/nursing care and technological support to sick and/or high-risk premature infants. Premature infants (infants born before thirty-seven weeks gestation) are the largest group of infants who require this high-tech environment to survive. Most preterm infants stay in the NICU until their due date. Thus, if a child was born six weeks early, parents can expect that their child will be in the NICU for six weeks. The NICU often becomes a second home for many families, where parents spend many hours each day with their infants. For the most part, these tiny infants must learn to breathe and grow before they can go home. Other infants who require this specialized medical/nursing care are either born sick with some kind of disease or have a congenital defect or syndrome. These infants require specialized care until they can be easily cared for by their families at home. This medical/nursing care may be supportive, palliative, or surgical in nature and is determined by the individualized needs of the child. The NICU did not exist until the early 1960s and the specialty of neonatology did not begin until the 1970s. These special units were established soon after the death of President John F. Kennedy's newborn son, who died of respiratory distress and immature lungs. He was born at thirty-four weeks gestation. His death brought increased awareness in the United States to the numbers of preterm infants who were dying because of immature lung development shortly after their births. Knowledge and expert care of these infants increased, and by the early 1990s more than 90 percent of these premature infants were surviving, including those infants born as early as twenty-four weeks gestation. There are more than 1,500 NICUs in the United States. Most are regional centers that provide training and consultation to a network of newborn nurseries in several communities. Regionalized care brings perinatologists (specialists who treat high-risk pregnant mothers) and neonatologists together to provide the best possible support and care to this special dyad. This is necessary because even though the NICU team can support the infant, most often the best place for the child is in the womb of his or her mother until forty weeks gestation, the normal length of a pregnancy. The ability to better support these vulnerable infants and families has changed primarily because of a substantial increase in knowledge and understanding of the physiologic, psychosocial, and neurobehavioral capabilities of high-risk infants. In addition to this enormous growth in knowledge, there have been many advancements in technology, such as the development of surfactants and the refinement of mechanical ventilation, that have greatly influenced the ability of medical personnel to physiologically support infants in the NICU. Research findings have contributed many facets and dimensions to providing care that further enhance the long-term outcomes for high-risk infants and their families. For example, although there is still some mystery to the underlying pathophysiology of retinopathy of prematurity (retinal damage related to immature developing retina of preterm infants, once believed to be related to too much oxygen therapy), refined management of the progression of the disease often minimizes long-term problems for these infants. The delivery of expert medical/nursing care requires the artful use of technology and the integration of developmentally supportive and family-centered concepts into routine medical practices. There are many different kinds of technology in the NICU, including different types of infant ventilators, monitors, and supportive devices, such as infusion pumps, oxygen hoods, and incubators. Although this equipment has become more responsive to the needs of the infants, there is still much the scientific and medical communities can learn about the use of technology to support neonates. The benefits of these machines are often coupled with iatrogenic hazards that may lead to long-term complications and increased numbers of chronic patients in the NICU. Although this equipment is intended to support infants in the NICU, many times all it does is increase the time infants spend in the NICU with little improvement in long-term outcomes. Technology must be used prudently with outcomes and cost-benefit as part of the decision-making process. Even with the technological advances and neurobehaviorally based interventions that are available to the premature infant, nothing can substitute for the normal environment of the womb. More than any other phenomenon, technological developments seem to have become the most transforming force in the advancement of neonatal care. It was the development of the first infant ventilator that many medical professionals believe actually "birthed" the NICU. Prior to that time, incubators kept infants warm but only the strongest survived in the small isolated special care nurseries. The equipment in the twenty-first-century NICU has evolved significantly since the 1980s and 1990s. Previously, equipment used in the NICU was developed as scaled-down versions of technology used to support adults. These adult designed machines, however, did not meet the very different and unique physiologic needs of the infant. Providing care in the highly technical environment of the NICU is challenging. Technologic interventions allow for greater medical support and management of sicker and smaller preterm infants. And, although these infants are indisputably more vulnerable and dependent on the care of others, they are continually developing and maturing into amazingly independent and resilient human beings. The professionals who work in the NICU are highly trained in the care of preterm babies. There are neonatologists, neonatal nurse practitioners, staff nurses, respiratory therapists, developmental specialists, occupational therapists, and physical therapists. This team of professionals works together with the family to provide a holistic approach to the management of the child's needs. Newborns can be treated for jaundice with phototherapy in NICUs, one of the many technologies available in intensive care units . Sometimes pediatric specialists are used as a resource when, for example, an infant requires cardiac surgery for a congenital defect. The neonatal team requests a specialized consultant, who is then invited to examine the child and his or her medical records and provide focused input with regard to the continued management of the child. Sometimes management requires surgery. Because the infants are so small and so susceptible to infection, this surgery is often performed within the confines of the NICU rather than the institution's operating room. The decision regarding the operation's location is based on how well the NICU is equipped to handle the type of surgery required and the comfort of the surgeon with the NICU environment. Neonatal intensive care has become a leader in the provision of family-centered care, which recognizes the unique and individual needs of each infant and family. Family-centered care is a philosophy of care in which the pivotal role of the family is acknowledged and respected in the lives of children. Within this philosophy, families are supported in their natural caregiving and decision-making roles, and medical professionals respect their unique strengths as people and families. Family-centered care recognizes and promotes normative patterns of living at home and in the community. Parents and professionals are seen as equals in a partnership committed to the child and the development of optimal quality in the delivery of all levels of health care. Family-centered care also helps the family achieve the best possible environment for promoting the growth and development of individual members of the family. Family-centered care strengthens the family unit through advocacy, empowerment, and enabling the family to nurture and support their child's development. Family centered caregiving interventions include individualizing care to include providing clustering of caregiving tasks. "Clustering" caregiving increases rest periods for the infant, providing medical and supportive interventions based on the individualized behavioral cues of the infant, supporting the infant's long-term development by acknowledging the infant's post-conceptional age when choosing interventions, paces procedures, and integrates the family into the interdisciplinary caregiving team. Particular interventions might include providing developmentally supportive positioning, skin-to-skin (kangaroo) holding, music therapy, infant massage, and/or cuddler programs. However, individualized interventions unique to the needs of each child are the key to success with a particular infant and family. Although some infants die in the NICU, the number is relatively low compared to the number who are cared for and discharged home as relatively "normal" with their families. Albritto, Sabra, Donna Acosta, Deanna Bellinger, and Denise Farmer. You Are Not Alone: The NICU Experience. Boston: Children's Medical Ventures, 1998. Als, Heidelise. "Developmental Care in the Newborn Intensive Care Unit." Current Opinion in Pediatrics 10 (1998):138–142. Als, Heidelise, and Frank Duffy. "Neurobehavioral Assessment in the Newborn Period: Opportunity for Early Detection of Later Learning Disabilities and for Early Intervention." Birth Defects: Original Article Series 25 (1989):127–152. D'Apolito, Karen, Jacqueline McGrath, and Andrea O'Brien. "Infant and Family Centered Developmental Care Guidelines." In National Association of Neonatal Nurses Clinical Practice Guidelines, 3rd edition. Des Plaines, IL: National Association of Neonatal Nurses, 2000. Gibbons C., S. Geller, and E. Glatz. "Biomedical Equipment in the Neonatal Intensive Care Unit: Is It a Stressor?" Journal of Perinatal and Neonatal Nursing 12 (1997):67–73. Graham, Susan. 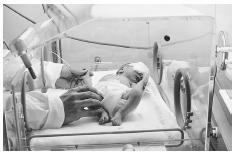 "Futile Care in the Neonatal Intensive Care Unit: Is Aggressive Care Always Justifiable?" Journal of Neonatal Nursing 5 (1999):23–26. Jamsa, K., and T. Jamsa. "Technology in Neonatal Intensive Care—A Study of Parents' Experiences." Technology and Healthcare 6 (1998):225–230. Johnson, Beverly, E. S. Jeppson, and L. Redburn. Caring for Children and Families: Guidelines for Hospitals. Washington, DC: Association for the Care of Children's Health, 1992. Merenstein, Gerald B., and Sandra L Gardener. Handbook of Neonatal Intensive Care, 4th edition. St. Louis, MO: Mosby, 1998. Miles, Margaret, S. G. Funk, and M. A. Kasper. "The Neonatal Intensive Care Unit Environment: Sources of Stress for Parents." American Association of Critical Care Nurses: Clinical Issues 2, no. 2 (1991):346–354. Zaichkin, Janette. Newborn Intensive Care: What Every Parent Needs to Know. Santa Rosa, CA: NICU Ink, 1996.